Human Resources is important to business. This is why businesses spend a lot to develop and manage this great resource. However, with advancement in technology there are now HR software solutions like PeopleForce to help businesses of all sizes manage their human capital more efficiently. PeopleForce is a versatile HR software that can handle all your Human Resource needs starting from recruitment to managing your people to employee compensation to managing the integration of your people to the culture of your organisation. With the digital HR management software, you focus on your people rather than managing procedure. The software handles a lot of the heavy lifting leaving you to concentrate on the core of your business – your people. You can also manage your HR on the go on your smartphone as PeopleForce is available for download at the App Store and Google Play Store. The HR software helps with recruitment. You can easily post vacancies and create recruitment teams who would review and rate applicants. 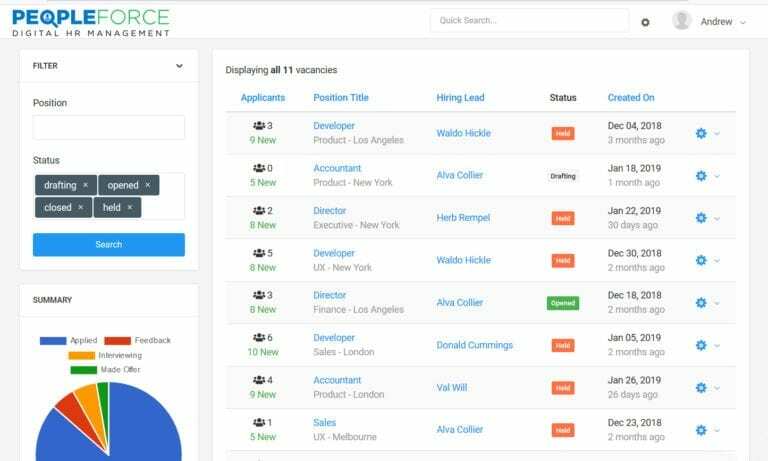 With PeopleForce, you upload all applicant data in one place where every member of the recruitment team can access it for feedback and review of applicants. You can also control what information about the candidates are available to the recruitment teams, ensuring only what they need to make their decisions like the CV are available to them and protecting the sensitive information of candidates. The software also enables you to design the form the interviews will take as well as how many interview stages. Using the Applicant Tracking System (ATS), you can also track ratings of each candidates through the interview stages. READ MORE: How Does Amazon FBA Function. And when finally you find the right candidate, PeopleForce makes it very easy to send job offer to the candidate. With support for PeopleSign eSignature technology, the new recruit can easily digitally sign the offer on their mobile phone or computer without having to go through the tedious process of printing, signing, and scanning before sending it back. Time tracking is an important HR function. This becomes even more cumbersome when employees are paid hourly. Making the need for a Human Resource Information System HRIS software very compelling. The PeopleForce HR software takes out the hassle in time tracking for payroll and employee compensation. It also makes it easy to track leave and paid time off (PTO). With Time Off Tracking, PeopleForce puts the request and approval of time off in one place, making it easy to find and manage. Employees can request for time off and managers can give approval using the mobile app or the website. The reporting system enables you easily make sense of your HR data. With just a few clicks the HR software will present a report that is easy to interpret and share. Once you enter the data, you do not need to go back and forth recompiling it each time. You just analyse the data to get a report that enables you make sense of your workforce. READ MORE: Features of Spotify APK and where to Download it. This frees HR department to concentrate effort on analysing resources, optimising workforce, and increasing productivity. PeopleForce does not only help you track your employee, you can also track projects to ensure they are done on time and within budget. The project management function is a bonus I must say to this HRIS software. You can also get customers updated by giving them access to the platform so that they can keep tabs on project milestones. Other features of the HR Management software include easy and structured onboarding and offboarding of team members. 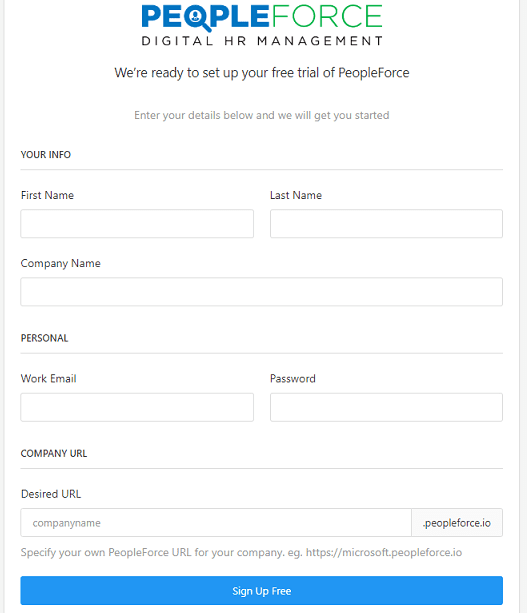 Signing up for PeopleForce comes with no commitment as the company offers a free trial to enable you know if the HR software is a good fit for you. Just visit the signup page, and enter the required details to proceed. Details required include your name, company name, work email, and password. You will also need to create your PeopleForce URL from where you access the platform. The URL will usually come in the format companyname.peopleforce.io. Once you complete your signup, the helpful team at PeopleForce will help you setup your account. You can now have access to the tools you need to manage your workforce effectively. PeopleForce can be downloaded for your smartphone on Google Play Store and the App Store. With the App, you can manage your HR functions on the go. Managers and members of staff can also download the app, so they can easily request and receive approval for stuff like time off, etc. Of course, the HR department can control the level of access each user in your company gets. While, you can download the PeopleForce HR software on your mobile phone, you cannot signup for an account on your phone. This is because, you will need the company URL created at signup to login to the app. You have to signup on the website first. Once your account has been approved and setup, you can then download the HRIS app for easy management of your workforce. 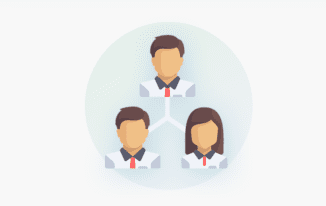 PeopleForce is a great tool for managing the workforce of small and medium sized businesses. The HR software enhances collaboration during recruitment ensuring you get inputs from all the right people, which improves quality of new recruits. And even when you get the right people, PeopleForce makes onboarding them easy. It offers time tracking, which provides you with the data you need to optimise your workforce for productivity.